Over the years we have tested a handful of bikes and products that were built around the narrow framework of the designer’s own ride experience. However, we have frowned on them because, more often than not, those user-specific designs proved unable to clear the hurdle of a more universal ride experience. Not so Lauf’s True Grit. The Lauf True Grit would qualify as one of those narrowly defined bikes. Designed by a group of cycling enthusiasts in Iceland for their local conditions, which can best be defined by the harsh winter weather, miles of unpaved roads and a need to ride through rivers where most of us would prefer a boat. Not exactly the type of conditions most of us would normally consider our own. In fact, when we visited Iceland for Lauf’s True Grit launch (RBA, November 2017), we had to endure ride conditions that—with driving rain and 50-plus-mph headwinds—were even harsher than we could’ve imagined. This was what precipitated a bike design by the folks at Lauf (“leaf” being the English translation) who thought it would/could/should enjoy universal acclaim. Lauf has been selling their unique leaf-spring suspension fork to mount onto others frames for three years now. And while the crew at Lauf knew the potential of their fork design and felt it could complement riders the world over, the reality was that close to zero frames on the market were designed around 30mm of suspension travel. The True Grit is their answer. It’s a complete bike (and frameset) that has been designed in conjunction with their fork for perfect synergy. In addition to the long 104.2cm wheelbase, the shapely, handsomely crafted carbon frame has a 6.6cm bottom bracket drop that allows for a long, low and stable platform. 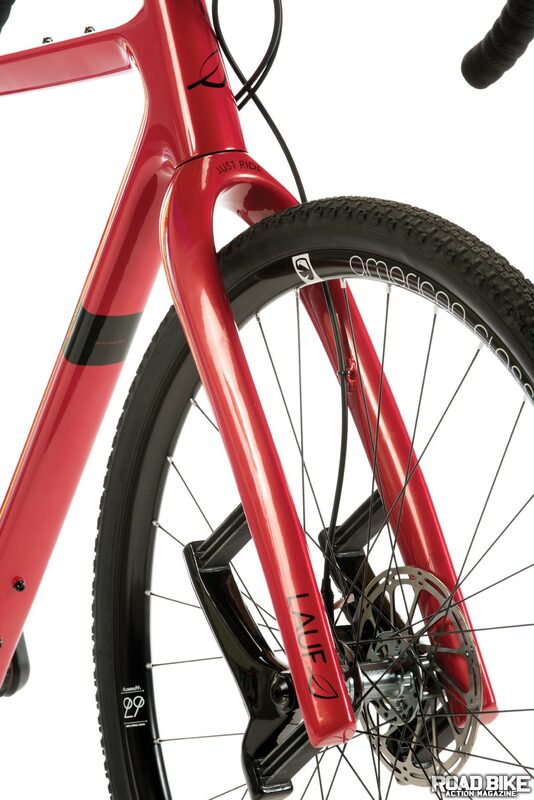 The Lauf relies on all the modern frame design cues, like flat-mount brakes, internal cable routing and thru-axles. The rear boasts plenty of room for large 45mm tires and leaves plenty of room for layers of grime. The most noticeable aspect of the bike is, of course, the Grit SL fork, which is an updated version of the original Grit fork. The SL version has straighter blades, has lost 50 grams and the spring rate has been stiffened. 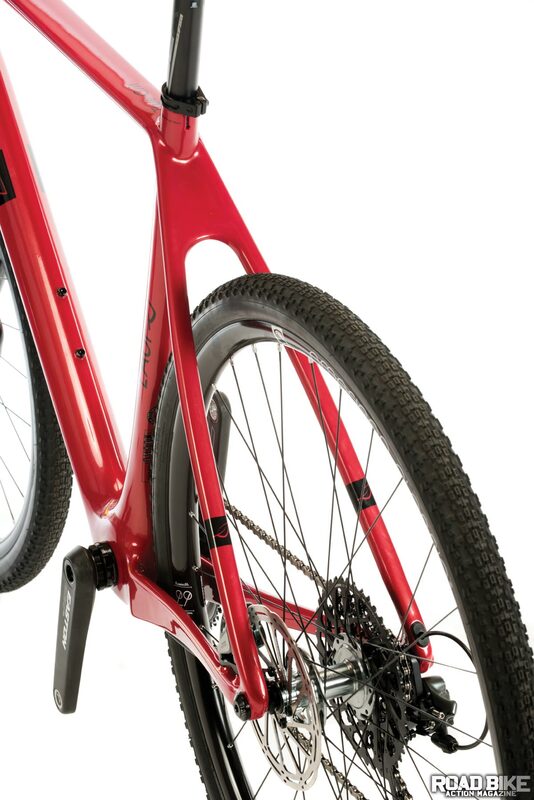 The Grit SL fork features six glass fiber springs per leg that flex under load giving 30mm of travel. Of the three complete bikes in the Lauf catalog, the mid-level Race Edition is the highest-end 1x version (the $6600 SRAM eTap model runs two chainrings). The SRAM Force 1 drivetrain is joined by a variety of Easton parts, including the EC90 SL 42t crank, 16-degree flared Easton EC70 AX carbon bars and an EA70 stem. An FSA SL-K 27.2mm carbon seatpost is topped with a WTB Volt Pro saddle. To keep things rolling a set of DT Swiss XR1501 wheels wrapped with Maxxis Rambler 40mm EXO/TR tires. The wheels are mounted with 160mm rotors to help slow things down. After returning from Iceland and the harsh weather without a single pedal stroke on paved roads, we were interested to see how the True Grit would fare in the concrete jungle. Happily, despite the big tires and suspension, we were more than able to keep up with the weekly group ride (the 42x10t tall gear helped). Better still was when the group ride would hit extended patches of rough pavement, and, thanks to the fork and tires, we could just sail past with nary a care in the world. Once in the dirt, we frequently found ourselves drawn into corners going faster than we should. 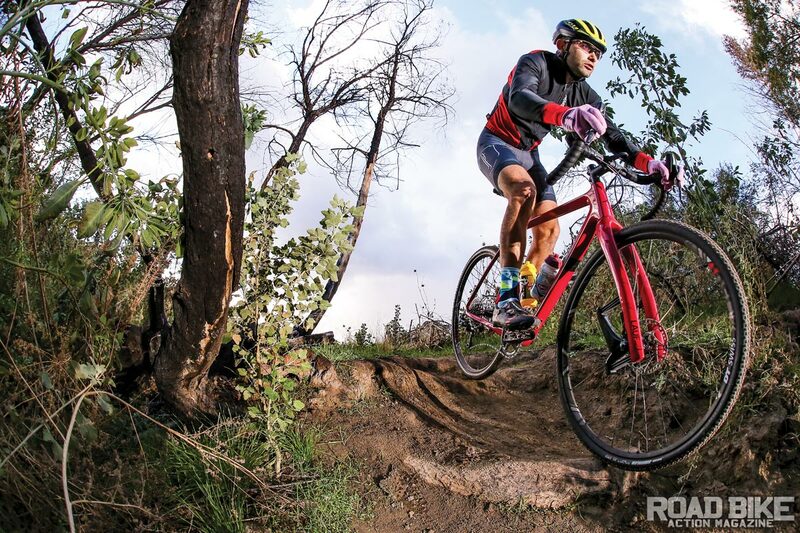 The True Grit is so stable and confidence-inspiring that every test rider noted how they had never previously descended down bumpy fire roads as fast on any other drop-bar bike. 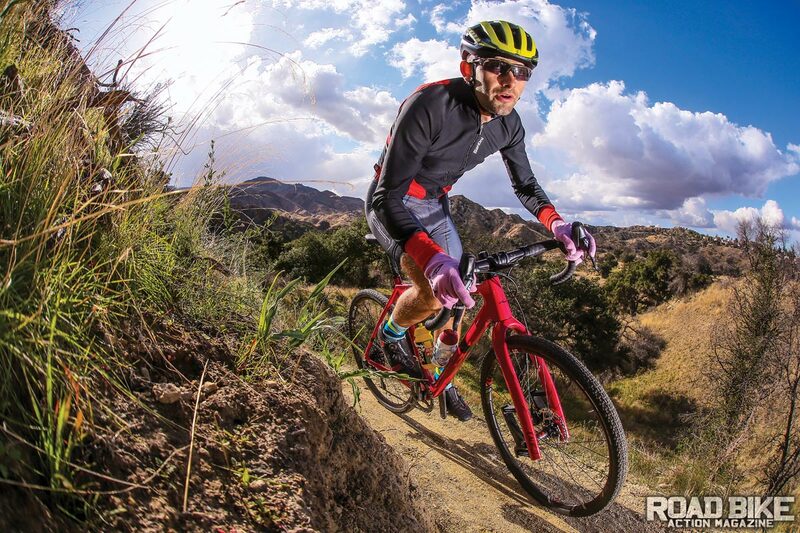 One downside to the advantage of the front suspension was when the unsuspended rear tire would hit the same sharp-edged bumps that the fork was soaking up and—you guessed it—pinch flats! The bottom bracket is low, so pedaling through sharp turns or over obstacles takes some practice and timing. The oversized fork is stiff, and even though it takes some serious effort to push through the entire 30mm of travel, we never found a hint of front-end wobble through the rough stuff—just point and shoot! 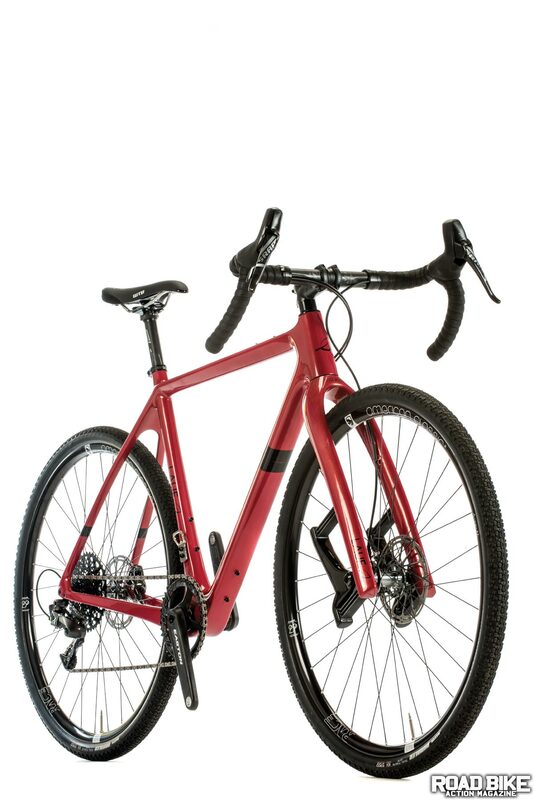 The Lauf True Grit is leading the trend of a new age of bikes with enhanced capability and versatility that give nothing up in terms of all-around performance. This is no cross bike modified for gravel. Actually, with its geometry specifically designed to match the wild-looking but practical Grit SL fork, this is like no other bike on the market today. We know it’s early, but a sub-18-pound carbon gravel bike with front suspension that sells for $5000 and rides as impressively as the True Grit would easily make the bike a contender for Gravel Bike of the Year. The fact that it’s just as capable on the road only enhances the Lauf’s appeal.